In 2011 I’ll be starting a new series featuring the Storefronts of Portsmouth. Today’s image captures many things I love about Portsmouth. A quaint storefront of a local business, a richly painted entrance, a shop nestled up against others alongside, a brick sidewalk, the warm glow of a shop where you can meet people (not a robot on some website). 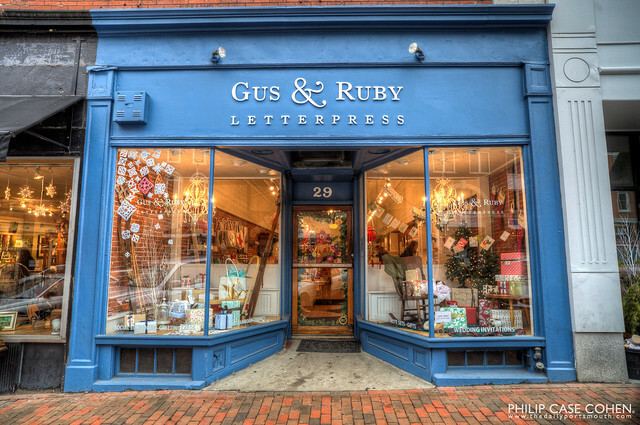 Gus & Ruby Letterpress is a cool stationary and invitation boutique on Congress Street, which moved during 2010 from its former location of a little spot on Market Street near the salt piles. It’s always a great thing when a business needs to move to a bigger space in order to meet the needs of its customers…it means business is thriving. I had the chance to visit the shop a few months back, and loved how much detail and thought went into decorating the interior. I love capturing detail, though I’m not always the best at creating it – so it’s always fun to see what folks come up with. Stop in to see them sometime. Phil, this is Main St., USA. I appreciate the homey feel of storefronts in a small, or at least, mature, town. You can feel the energy of years ago when that area was likely the busiest spot in town! Very much looking forward to this series! I agree with Jim. I have passed by this place almost whi knows how many times – almost every day – and never really stopped to look at it, which is my bad. Now I want to look at all of the other storefronts as well to see what I have been taking for granted! I just stumbled upon this photo again in my archives. I love it so much. Can you email me about your fees for usage? I’d love to be able to use this on our website and social media if possible. As you know we are huge fans!